Do you suffer from chronic sinusitis? Balloon Sinuplasty™ may be right for you! Sinusitis affects more than 36 million people each year making it one of the most common health problems in the U.S. When you have acute or chronic sinusitis, the mucous membranes of your nose, sinuses and throat become inflamed, possibly from a pre-existing cold or allergies. 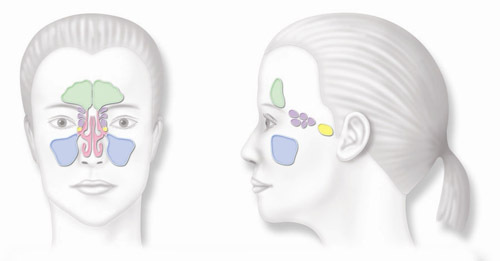 Swelling obstructs the sinus openings and prevents normal mucus drainage, causing mucus and pressure to build up. Chronic sinusitis occurs when symptoms persist more than 3 months. Typical treatment for sinusitis begins with medication, however, many patients suffering with chronic symptoms do not get relief when treated with medications. For these patients, a surgical procedure may be recommended. Balloon Sinuplasty™ is a minimally invasive procedure that opens the sinus passages relieving the pain and pressure associated with chronic sinusitis. More than 250,000 patients have been treated by physicians using Balloon Sinuplasty™ techonology. While recovery time varies with each patient, most are able to return to normal activities within 48 hours. Please contact the ENT Institute of Michigan to find out if you are a candidite for Balloon Sinuplasty™.